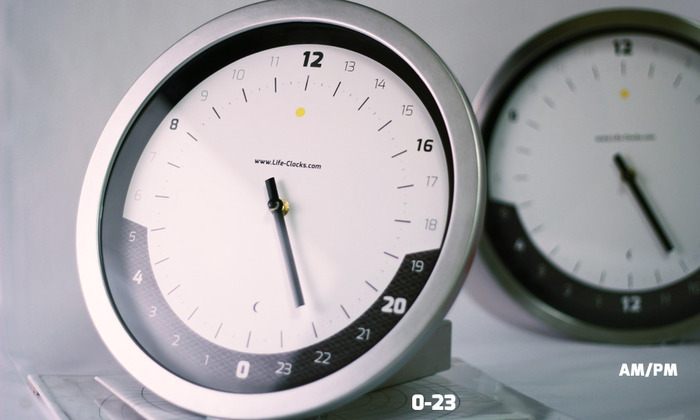 Chris Wiegman has set up a Kickstarter campaign to build 24 hour clocks. There’s already an iPhone app, with iPad and Android apps to follow if the campaign is successful. The basic idea seems to be that you can customize the clock with your activity schedule, around the outside, seeing at a glance how the different activities during the day are organized. This is one of the helpful aspects of the 24 hour dial – we’ve heard from Sylvie about her work in Sweden with the Pajala Klockan. And the clock designed for Saffron allows you to change the length of the night and day sections. On the app version, you can change the labelling and colours for the various sectors, or switch between various presets. For more information about the Life-Clocks project, visit http://www.life-clocks.com.